This photo was taken in one of the original hangars of the Clinton County Air Force Base. 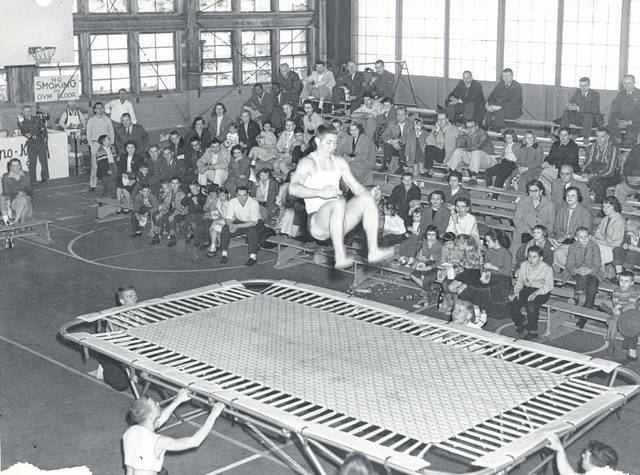 The gymnastic troupe was from the University of Maryland and was invited to perform at a “Gymkana” by Lt. Milligan, himself a gymnast. He was later one of the victims of the air disaster. The group returned in 1958 and the public was invited to the performances. WNJ reader Joyce Hater Wells, who worked on the base, is seated on the left, about three rows from the top, next to her younger brother, Ed Hater. In the top row on the right are Lt. Kay, Information Services Officer, and Col. Bentley, the Base Commander. Does anyone remember this or recognize anyone in the photo? Let us know at info@wnewsj.com.